We recently went to see the movie The Best Exotic Marigold Hotel. It is charming, funny, sad, poignant, and most of all thought provoking. We can’t recommend it more highly than tell you that weeks later we are still talking about it, quoting from it and reflecting on its life messages. The cast is phenomenal and so is the setting. Judi Dench, Maggie Smith, Tom Wilkinson, Bill Nighy, and Tena Desae, a relative newcomer to film. The inexperienced, but hopeful hotel owner/manager is played by Dev Patel from Slum Dog Millionaire. His character is sunny as is his name, Sonny. It is the story of English retirees who for a variety of reasons, many financial, retire to a newly advertised retirement hotel property in Jaipur, India. On arriving, they discover it is not the well manicured resort pictured on the internet, but something else entirely. The film is really about how people when thrown into new, unusual even unpleasant circumstances, adjust to life. Of course, not all of the characters adjust, which highlights that life is always what you make it. The film has wonderful dialogue. The best line in the film is Sonny’s statement about the circumstances faced at the hotel. He says,” Everything will be all right in the end. So if it is not all right, then it is not the end.” Everyone laughed, not because it sounded so silly, but that it sounded so right especially today. Two of the film’s characters sum up their retirement experience beautifully when one says, “Nothing here has worked out quite as I expected.” The other responds with, “Most things don’t. But sometimes what happens instead is the good stuff.” Life often serves up the good stuff in totally unexpected ways. Being flexible and adventuresome, or at least with a sense of curiosity allows us to see and appreciate the good stuff, or unexpected joys. We tell people that we hope they will rewire into new activities that have the potential for fulfillment and nourishing experiences, in essence, more good stuff. Most of the guests at the Marigold Hotel are examples of how rewiring, even forced rewirings, can open doors if you are open. You also see how failing to be open, or being too rigid or set in ways, may lead to frustration and misery but doesn’t have to be a final sentence of a doomed life. The movies characters are much like our readers and clients as they face their retirement journey. They start rewiring doing one thing and end up doing something totally different. For many the doing something different was a pleasant surprise. They ended up having a better rewirement than they ever expected. It wasn’t because they had more money or more possessions, a bigger house or finer car. It was because they tried new activities and found something to be happy about….volunteering, doing a new kind of work, going back to school, traveling for educational purposes, teaching English as a second language. Whatever it was, it gave them something special, a reason to hop out of bed in the morning, and face a new day with purpose and hope. So remember, if it’s not all right, it’s not the end. You can still try something new! 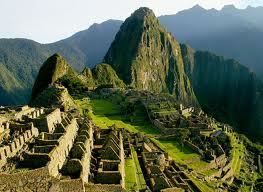 I just came back from 10 magical days in Peru. Visiting Machu Picchu was the initial objective for the trip but seeing Peru’s many other treasures made the whole trip an even greater experience. Too often people omit visiting country capitals; they view them as being only big cities, but Lima, the only capital of a South American country located on water, was a highlight and a culinary surprise. The food in Lima was delicious, especially if you like fish and ceveche, and a great drink called a Pisco Sour! Cuzco, one of the highest cities in the western hemisphere, and the capital of the Incas was beautiful and the magnificent historical site, Machu Picchu was beyond words; everything that I had imagined, and more. Rick Miners, my husband and co-author of DON’T RETIRE, REWIRE! and I have always advocated doing the heavy lifting first when it comes to travel. In other words, do the more strenuous travel when you are in good shape. People often tell us that they have visiting Angkor Wat, the Great Wall of China, the sand dunes of Namibia or Ayers Rock on their bucket lists. These can be wonderful adventures, but not necessarily for the weak of heart or knee. Our rewiring® advice? Get them on your travel schedules as early as possible. Of course you’ll see people aged 70 or 75 at these extraordinary sites but most admit wondering what the experience would be like if they were younger and in better health. Sometimes you can put off going on a trip and then have it become too physically intimidating or medically impossible to go. I’m not working for Peru tourism however… the Sacred Valley, religious temples, mummies, remnants of the Spanish conquistadors, Lake Titicaca, great crafts, lovely people, even golf courses, not to mention Machu Picchu are reasons to put Peru on your bucket list. What makes it additionally interesting is that the Incans had no written language and no way to do the architectural feats they accomplished. So check out what you have on your own bucket list (and we hope you have one!) and start to prioritize what trips and adventures you should undertake sooner rather than later! Do your heavy lifting first! We’re not doom and gloom people, just realists!